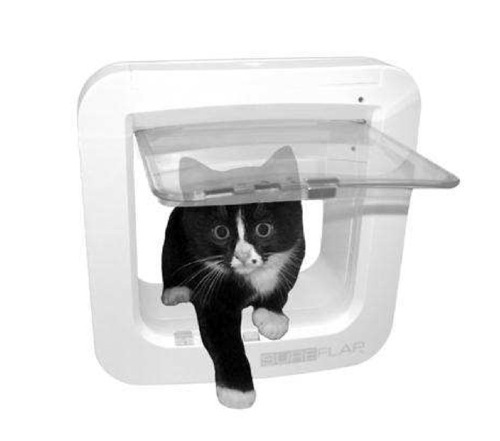 SureFlap Lets Only Your Cat In The House | OhGizmo! Cats tend to be creatures that like to come and go as they please. Sure, you can try and regulate when they are outside and when aren’t, but at the end of the day, the cat only comes back in when it wants to. One option you have is to install a cat flap, which will let them enter and leave when they chose. Of course the downside is that any cat can make their way into your house. That’s why you need a SureFlap. If you don’t mind implanting your feline friend with a tiny microchip, then this might be a great solution for you. When your cat walks up to the door, the ID chip will let the door know that its safe to open, and it will do so. The real question is how much the device will cost, since there is no word on pricing or availability.